The DCP-485 is a compact RS-232- to-RS-485 converter which features a complete electrical isolation barrier and heavy duty electrical surge protectors. 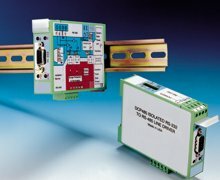 These devices feature a DIN rail mountable enclosure, for application to a junction box, a panel, a relay rack, the side of your computer, or anywhere a DIN rail can be mounted. Isolation is provided by optical couplers and a transformer-isolated dc-to-dc converter. The RS-232 connection is made through male or female EIA 9-pin D sub connectors, or a 3-wire RS-232 connection can be made through convenient pluggable screw terminals. The RS-485 connections are made through convenient pluggable solderless screw terminals. The DCP-485 series is designed for full duplex operation over two-wire pairs. Outputs are tri-state, allowing multidropping of up to 32 units. Data rates are up to 115.2 K bits per second (baud). Four diagnostic LED indicators are provided for installation guidance and system troubleshooting. The RS-232 interface includes Request To Send (RTS) and Data Terminal Ready (DTR), either of which can be used via a DIP switch to enable the RS-485 transmitter. Alternately, the DCP-485 offers automatic line switching: the RS-485 transmitter is enabled automatically by each character sent on the RS-232 Transmit Data (TD) line. Additionally, the RS-485 transmitter and receiver can be independently enabled continuously or under RS-232 control. A convenient null modem switch is provided for the data lines. Also, line termination switches independently connect line termination and line bias resistors to the RS-485 lines. The units are powered from wide-range voltages of +10 to +30 Vdc through pluggable solderless screw terminals.